Wow! 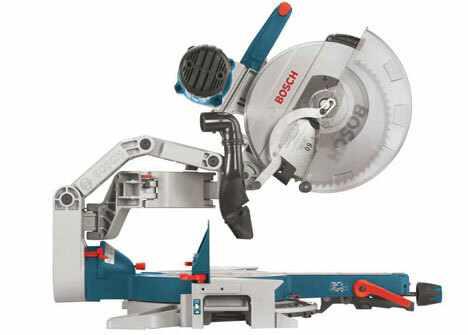 I just had the privilege of trying out Bosch’s new 12” Duel-Bevel Miter saw; and I came away impressed. This saw, like the previous model, has all the up-front controls, which can really save time and strain on the back (no reaching behind to set the bevel); but when you look at the GCM12SD you’d think that something is missing – that it’s not a ‘slider’ – it’s too small. Exactly! 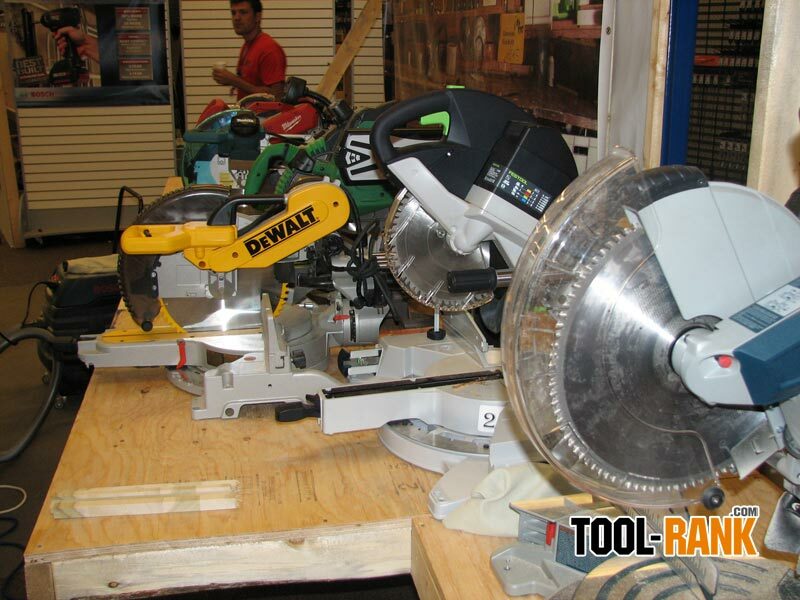 This saw doesn’t have sliders or rails; this saw GLIDES. Bosch’s Axial Glide System completely does away with the sliding rail system, yet provides 14” of horizontal cutting; and best of all takes up the space of a ‘chop saw’. For me, this means when on the job site, setting up production in a corridor or hallway, I’d have an extra foot of work space and no moving parts banging into the wall; and I can make my cuts without always waiting for a worker to pass behind. 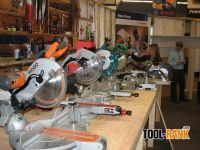 Referring to the photos I took (below), you’ll see: Rigid, Milwaukee, Makita, DeWalt, Hitachi, and Festool – all on a workbench with Bosch; there you can really notice the space savings over the sliding rail system. In real work conditions I’ve tried all these major brands of sliding miter saws (including Bosch’s older model) and found that they all are prone to have sticking problems. The bushings gum up with sawdust and I find myself having to force the saw forward. The Axial Glide System solves this problem with its articulating arms, which glide the saw through the cutting stroke. In fact, the saw travels so effortlessly that they’ve added a resistance adjustment (just in case you find the saw too smooth). Cutting through a 14” piece of maple, I could feel how stable and precise the saw traveled through the entire stroke. And this system is tough; I watched as Jason, a proud Bosch product manager, splintered a couple of 2X4’s over the glide system without damage of misalignment. This Value Conscience Pro can hardly wait to set this saw up on the big job and see the reaction of the guys as they ‘glide’ through the crown, base and casing.